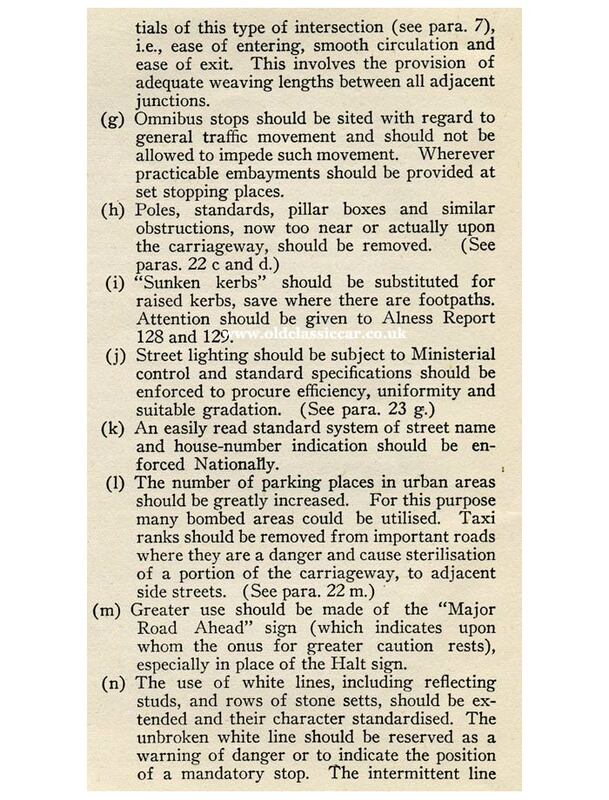 Post-war road & traffic planning, published 1944. Homepage. 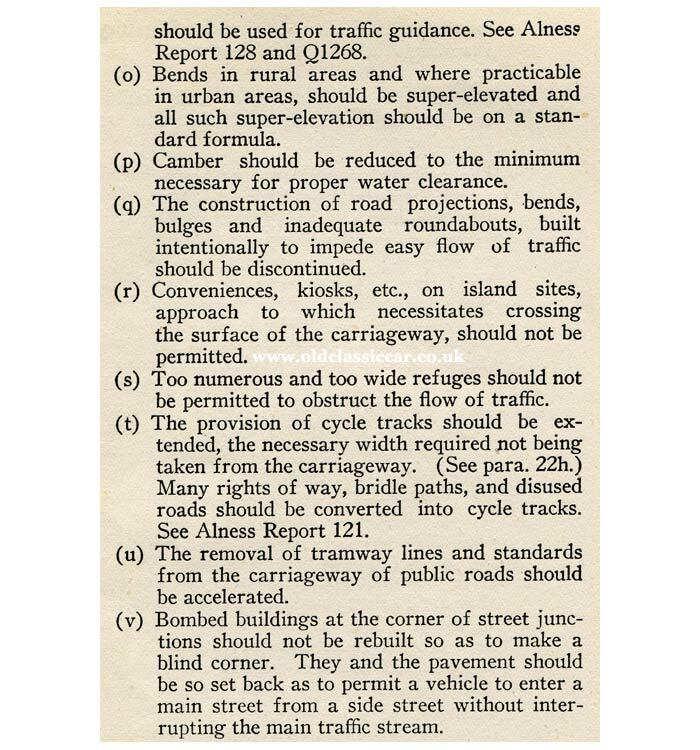 This page: Policy suggestions published during WW2 regarding post-war road & traffic development. July 1944 saw the rocket-powered Messerschmitt Me 163 Komet enter operational service, while V1 "doodlebug" bombs continued to wreak destruction across the South East of England. 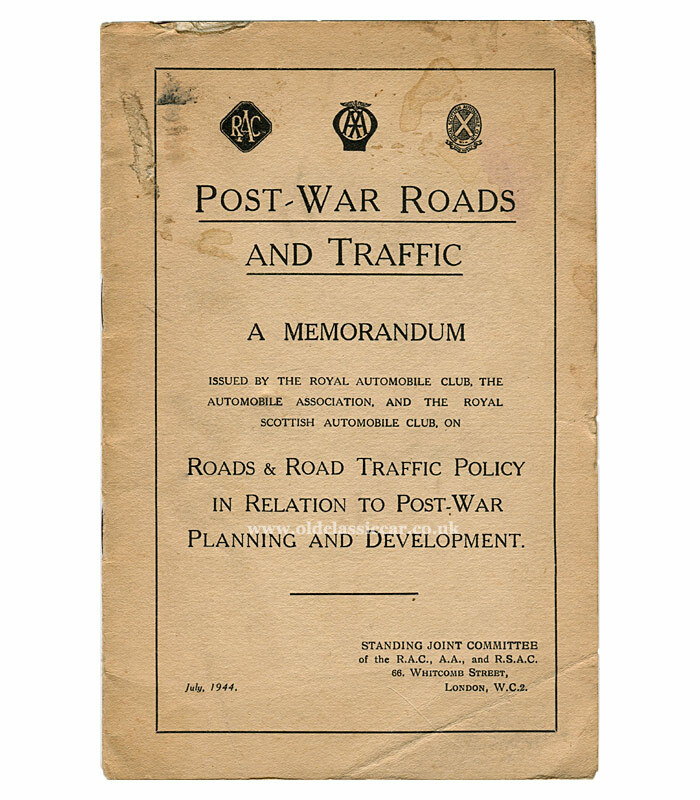 It was also the month that a joint committee comprising representatives of the AA (Automobile Association), the RAC (Royal Automobile Club) and the RSAC (Royal Scottish Automobile Club) published their proposals for road and traffic management and development, for the post-war era. The text-only write-up, which comprises sixteen pages in all, was issued in July 1944. 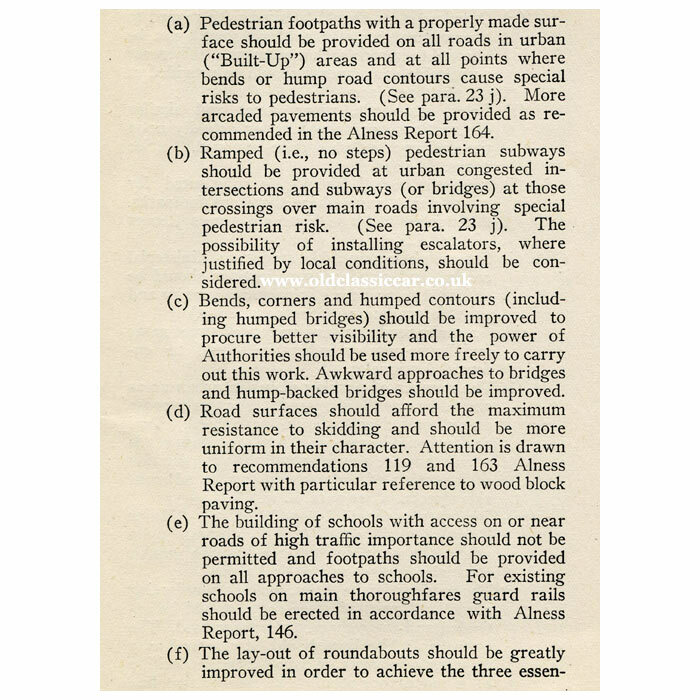 Presumably it was intended for audiences within government and associations relating to road transport. This copy somehow survived into the 2000s, and was found in a house clearance shop in Stockport. For the princely sum of 30p it found its way into my bag. This musty old shop, run by an old bloke with his dog, could be relied upon to turn up quite a variety of interesting old publications, and several have already found their way onto the site over the years. The shop no longer exists, but I've happy memories of hours spent rooting through piles of old books in its gloomy cellar, lit by a single bulb hanging from the ceiling. Evidently, despite the war being far from over, thoughts were turning to how the country might operate once peace had returned. The efficient use, repair and development of the existing road network, which had seen little if any investment since the outbreak of war, was going to be key in helping the country rebuild its infrastructure. Motorways too were also beginning to feature in the thoughts of road planners, no doubt after witnessing the effiency of German autobahns and Italian autostrade built during the 1930s. "This Memorandum embodies the considered recommendations of the Standing Joint Committee of the Royal Automobile Club, the Automobile Association, and the Royal Scottish Automobile Club. 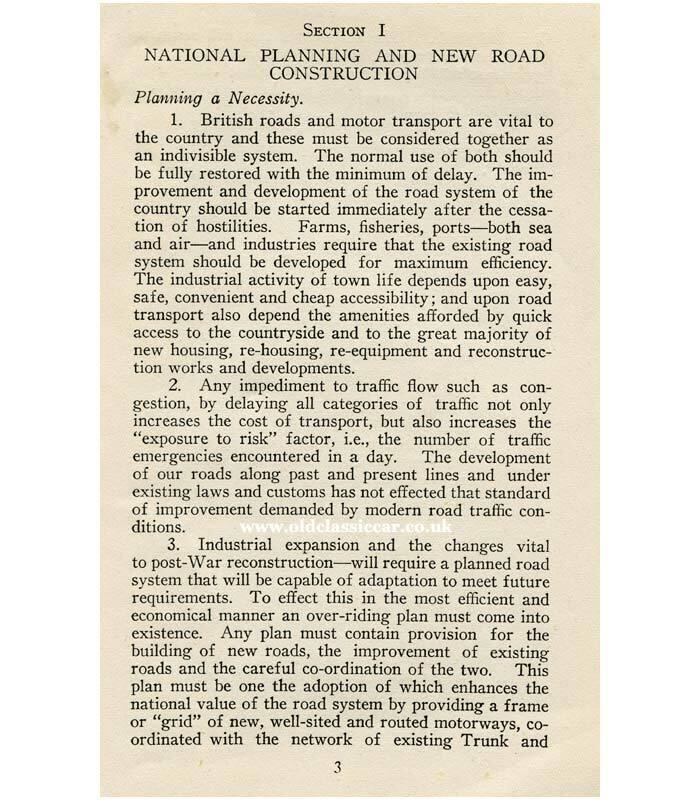 It is based upon nearly half-a-century of active pre-occupation in the problems of motor traffic and is viewed in relation to the problems of post-war planning and development which are now receiving the attention of the Government and of Parliament." "Whilst the Committee is unanimous in affirming that the country as a whole is in full support of the Prime Minister and the Government in the absolute priority of winning the war, it is also convinced that public opinion will demand and obtain a relaxation of bureaucratic control and direction as soon as possible after the war is won. Laws and regulations cannot be enforced without the instinctive support and goodwill of the majority of loyal citizens." NATIONAL PLANNING AND NEW ROAD CONSTRUCTION. NEW ROAD CONSTRUCTION - MOTORWAYS. Priority should be given to the construction of new motorways, according to the Committee, especially important given that by this point no motorways currently existed. In fact it would only be in the late 1950s that the first stretch of motorway, the Preston Bypass which was later absorbed into what became the M6, came into use. "The provision of new motorways of sufficient width will have many advantages, notably regarding public safety. They will be economical in regard to land and cost. They will be far more rapid in construction and cause less inconvenience to traffic than the adaptation of existing roads. They will be capable of having a greater respect for amenities and will relieve the traffic, and thus improve conditions, upon existing roads." "The new motorways would be used by motor traffic only. They would not pass through any town, but the towns bypassed and large towns adjacent to the motorways would be connected with them by appropriate types of roadway." "The motorways should not contain any intersection, not even of the roundabout type. Road intersections besides being a major cause of traffic delay, with the consequent waste of human and vehicle time, also contribute materially to the number of accidents." New Motorways, Trunk and Classified Roads required to further the plan already outlined. Circular Roads and Ring Motorways based on the principal towns with connections from those towns to the new motorways." 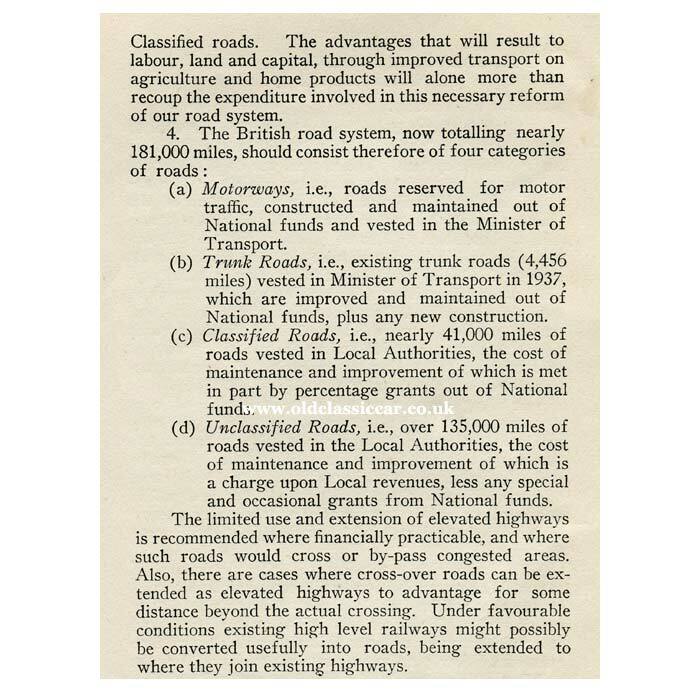 Page 6 begins to list out the priorities that should go to forming a post-war development plan, noting that "... the roads and bridges of Great Britain are progressively deteriorating as a result of the diversion of men and material and funds from road work to the war effort." Approximately 100m GBP of funding should be earmarked for all road improvements following the Armistice, it was suggested. Improvements included the removal of all blind corners, while large-scale specific projects should also be undertaken. These included, for example, tunnels under the lower Thames at Dartford and Blackwall, a bridge across the Lower Severn, and high-level bridges over the Forth, Humber, Thames (Woolwich) and Tyne rivers. The Committee was keen to stress that focus on improving existing roads should not be lost, while considering plans for new infrastructure in future years. A whole host of improvements are suggested. These included pedestrian footpaths on all urban roads, the location of omnibus stops in such a way that following traffic is not impeded by buses pulling over to collect or drop off passengers, a new consistent standard of street and house naming should be enforced on a nationwide basis, increased parking spaces for cars within urban areas, and acceleration of the removal of tramway lines from public roads. Many of the objectives listed on the following pages could probably be found in modern-day publications regarding traffic flow and improvement, although now the emphasis appears to be on slowing down vehicles, reducing available parking spaces, and generally making urban areas into "no-go" zones for road vehicles, especially those that do not conform to the strictest emissions levels - not a consideration back in the 1940s, but very much the case now. Bombed buildings that happened to be situated on street corners, should not be rebuilt in case by so doing it created a new "blind" corner. In public parks and on commons to which the public have rights of access for air and exercise under the provisions of the Law of Property Act, 1925, spaces for the orderly parking of vehicles and rights of access thereto should be provided, Section 193, subsection 4 of the Act being amended accordingly. On all motorways and main roads parking places should be provided at scenic points and other places where stationary vehicles tend to congregate on the carriageway. Vehicles should not be permitted to travel two abreast except for as long as is necessary for overtaking. Cyclists should not travel more than two abreast except when overtaking, and even then in no circumstances should there be more than three cyclists abreast on the carriageway. Road repairs and excavations should be treated as matters of extreme urgency and day and night shifts should always be used on such work. More effective steps should be taken to deal with "crawling" taxicabs. The Highway Code should be revised and given the force of law. It should be made applicable to all road users, ie drivers, cyclists and pedestrians. Street trading should be limited and confined to unimportant streets. The use of headlights should not be permitted where street lighting confirms to the official standard. Cycles should be subject to registration and numbering of machines at a nominal charge. They should also be subject to certain use and construction regulations, among them those dealing with the provision of effective brakes, the carrying of a rear light in hours of darkness, and the use of a bell. Tolls and level crossings should be abolished. Evidently a lot of thought had gone into the production of this memorandum. I doubt that many copies of this were produced, and I'm sure few copies of it survive. It makes for an interesting read, both as an insight into how key motoring organisations wished to see road and traffic regulation and improvement be made following the war, and also the underlying optimism that maybe, just maybe, the end of the war might be in sight. The war in Europe would in fact come to an end the following year, in September of 1945, but it would be a long time before many of these recommendations were acted upon, and a good number remain in the "work in progress" or "dismissed" file to this day.